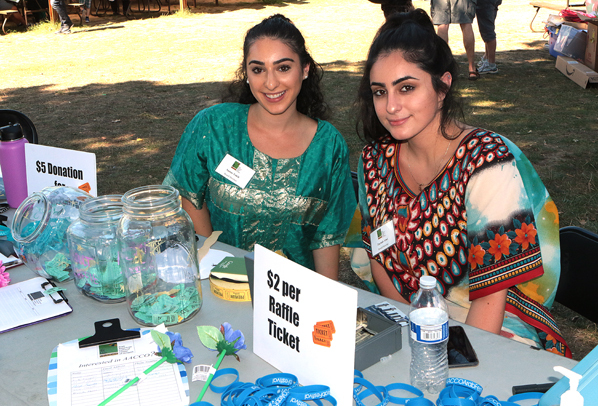 Samar Fakie and Zaynab Atwi welcome visitors to this year’s annual Mahrajan, presented by the Arab American Cultural Center of Oregon, and held in East Portland. From all over the Portland metropolitan area, celebrants came to historic Oaks Amusement Park for the 2017 “Mahrajan”, an event in Arabian culture meaning “a cross between a concert and a party”, all day on Saturday, September 2. 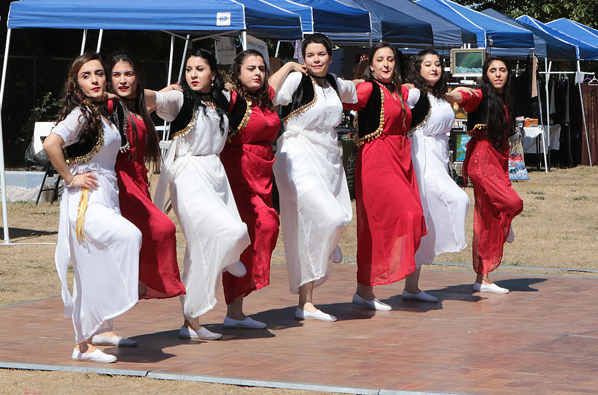 Centered in the south section of the park, along the Willamette River, this fair – hosted by the Arab American Cultural Center of Oregon (AACCO) – proved to be a fun and family-friendly day filled with games, dancing, music, and food and crafts from around the Arab world. 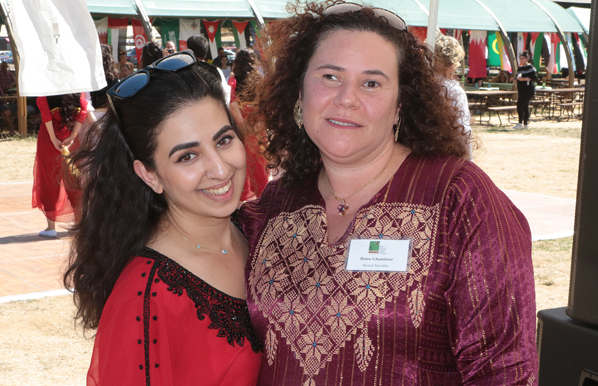 AACCO Board Member Zeina Atoui spends a moment with the association’s president, Rima Ghandour. Members of the Delale Dance Group performs a traditional Kurdish dance. “It is an Arab-American community event, to help get people together – not based on race, or religion – just to get everybody out here from all 22 Arabian countries, including newcomers to the United States, refugees, and people who of immigrated here decades ago. All come together to celebrate our rich culture,” Ghandour explained. “Just as important is that this gives us a delightful way for us to interact and meet the greater community here in Portland, helping them learn about us, our art, food, and other cultural activities,” Ghandour told East Portland News. 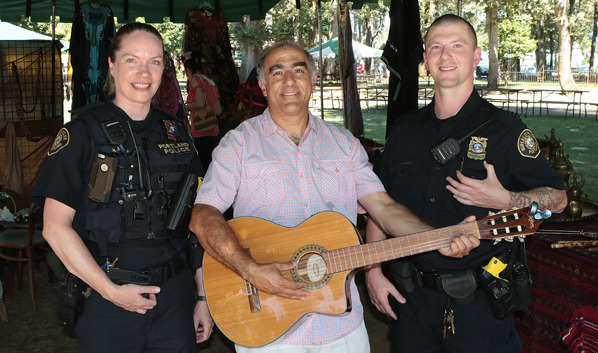 Central Precinct Police Officer Caroline Greulich meets the author of the book “The Traveler”, who is also a musician, a Palestinian from East Jerusalem, Mohammad Bader – as also does Officer Michael Greenee. To escape the heat, a crowd of people listened to live music, followed by a demonstration of folkloric dancing. Others toured a bazaar of Arab-American businesses, while yet other guests took in art and cultural artifact exhibits at the festival. 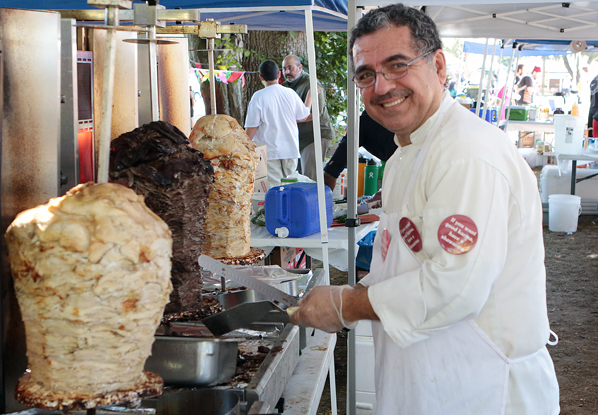 Lebanese Chef Abraham Madi, of the Sesame Donuts stores, prepares to slice of some freshly roasted meat to make shawarma. The freshly-cooked culturally-specific food was enjoyed by many at Oaks Park, as were beverages – including Turkish coffee. 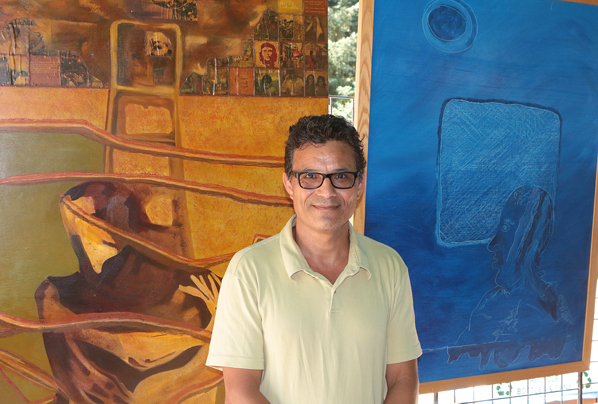 Palestinian artist and educator Kanaan Kanaan shows two of his works. “The common thread through my artwork is expressing social justice, introducing different cultures to one another, and presenting the beauty in our souls,” he remarks. Learn more about the Arab American Cultural Center of Oregon by visiting their website: CLICK HERE.